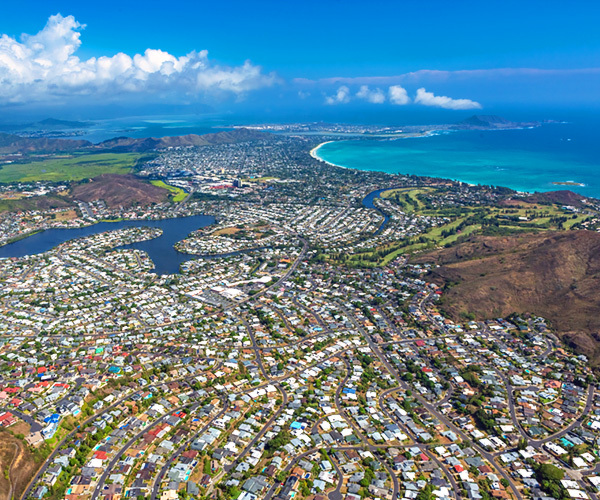 The city of Aiea covers almost 11,000 acres, from Pearl Harbor northward to the Ewa Forest Reserve. This community of 32,000 started out as a sugar plantation town centered on the Aiea Sugar Mill. In 1998, the sugar mill was demolished, and the people constructed a new Town Center. Within both the city limits of Aiea and Pearl City are all of the amenities one would want in a home town. The comfortable and attractive homes are generally in the moderate price range. The schools and churches are sources of community pride. The area offers public libraries, recreation centers, lovely parks, ball fields, medical centers and dental services, and, if anything, an overabundance of places to shop. Pearlridge Center, which lies between Kamehameha Highway and Moanalua Road, is a mammoth air-conditioned shopping complex built in two sections and linked by a monorail. Pearl City was settled by independent farmers and fishers. Pearl Peninsula, which jutted out into Pearl Harbor’s Middle and East Lochs, was where wealthy people built elaborate mansions. After the bombing of Pearl Harbor in 1941, Pearl Peninsula and its surroundings became the property of the military.